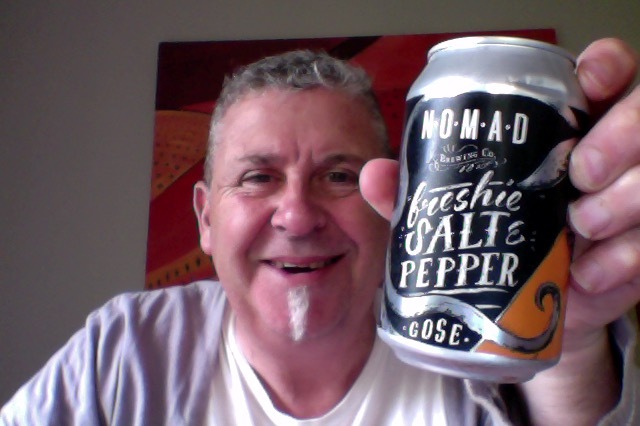 Nomad Freshie Salt And Pepper Gose. Salt. Pepper. Sea water. It sounds like someone was sitting in the sun too long to be honest. This is a 330ml can of a beer with 15IBU, and 4.5% ABV, about 135 calories a serve size, and this would be 1.3 standard drinking units. This beer is the brain child of Leonardo and Brooks, after a few…. staring at the beautiful Ocean in Freshwater, on Sydney’s Northern Beaches, the ocean mist and its fantastic smell had to be somehow put into a beer…. Why not add sea water directly to the beer and hey isn’t salt what they add to traditional Gose in Germany??!! A few months later here we are at Nomad adding two buckets of salt water straight from Freshie to a Gose with a Nomad twist and adding our new favorite pepper variety from Tasmania. So, What could possibly go wrong? Well it’s a rare old style beer, and so there’s not a lot of benchmark really. The initial aroma when you crack that can is somewhat like a saison, it’s light and unassuming. It pours crisp crystal clear and much more yellow orange, almost like a Cider in colour perhaps, quite rich, the head was, then wasn’t. That strange lack or aroma, but still an aroma is there. What a revelation of a beer, it’s light and fruity, sweet and tart, leaves a lovely lingering kiss of a dryness around the edges of the tongue. Delicious really. I think the idea that’s it is seawater and pepper, which is a pepper plant, as it happens is quite a mountain for some people to get up. I’m really happy with the fruitiness and the sweetness that this has, I don’t get anything that I’d say was salty, and I don’t get a peppery thing, but that might be because I’m confusing it with dryness at the end. Who knows. I knows though that I’m really liking this, and it’s a bit of a good summer sunshine beer, which is ironic since it’s not sunny or summary at all at there at the moment. I don’t know lot about Gose as a style. but I’m going to say that this isn’t far removed from things like a Radler perhaps, it’s that sweet and fruity, and it’s not at all that sour that’d you’d pucker up and give in. It’s nice to take every beer on it’s own merits, and to concentrate on why it might be good or bad, you can’t like every beer, but you can appreciate them. You should let yourself appreciate this one. The pdubyah-o-meter rates this as 8 of its things from the thing. I really like it. Refreshing, sweet, sour, tart, soft, and easy to get along with. Ideal drinking on a warmer day, and a great way to have a drink without it being heavy, or bland or run of the mill. This was fun to drink. Am I enjoying it? 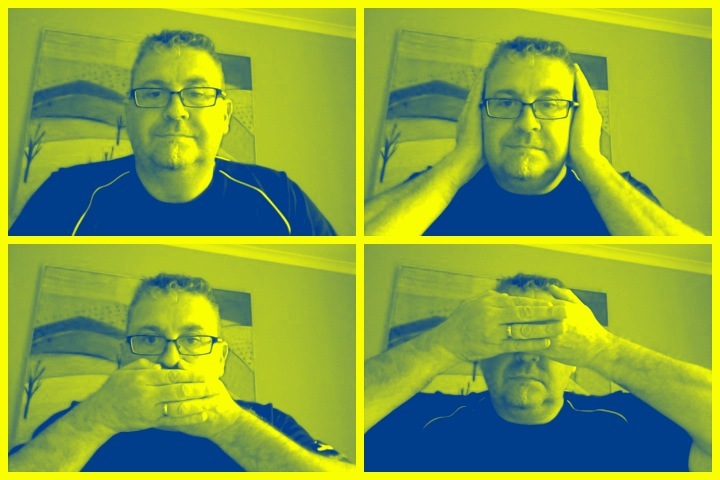 Yes, it’s a lot easier and more enjoyable than reading the label might lead you towards. Would I have another? Yes, this is up there with quaffing ale. Would I share with a friend on a porch and set the world to rights? I would, it’s a strange old style and worthy of talking about beer evolution and style preferences. William Onyeabor was a funk musician from Nigeria. Onyeabor’s songs are often heavily rhythmic and synthesized, occasionally epic in scope, with lyrics decrying war and sung by both Onyeabor himself and female backing vocalists. 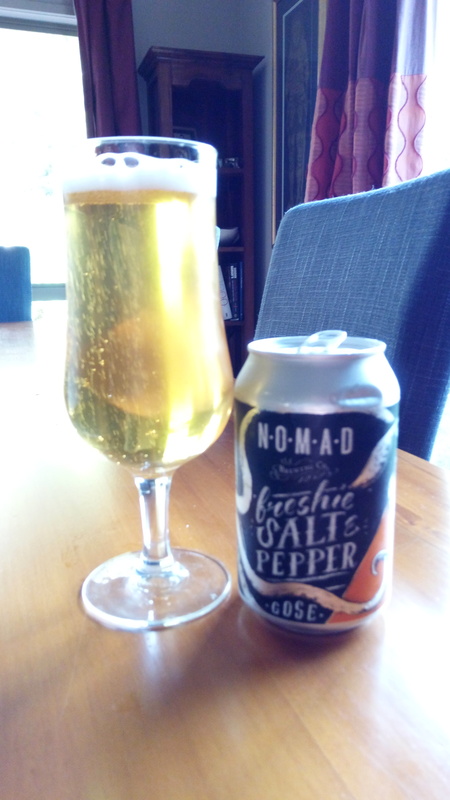 This entry was posted on January 19, 2017 by Philip Walter in Beer, Beer of Australia, Beer Review, Craft Beer, Critic, Grodziskie/Gose/Lichtenhainer, Justsaying, Nomad Brewing, Sour/Gose and tagged Australian Beer, Beer Jerk NZ, craft beer, Gose, Nomad Brewing, Nomad Freshie Salt And Pepper.